In times of crisis racists and fascists come out of the woodwork. Between the rise of the EDL and rent-a-historian David Starkey’s fear of ‘black culture’, Nottingham Playhouse’s recent production of The Resistible Rise of Arturo Ui (German: Der aufhaltsame Aufstieg des Arturo Ui) by Bertolt Brecht was timely. Written in 1941, in director Walter Meierjohann’s treatment this parable of the rise of Hitler retains all its savage potency and subversive dark humour. In Depression-era Chicago the cauliflower trust, fearful of falling victim to recession, accepts the protection of rising mob boss Arturo Ui (Ian Bartholomew) and his gang of heavies. Ui takes over the docks by blackmailing aged politician Dogsborough (William Hoyland), who fancies himself an old-fashioned man of honour and despises Ui as an uncouth parvenu. He extends his rule by intimidation and murder, eventually ridding himself of former ally Ernesto Roma (Nick Moss) and setting his sights on the neighbouring city of Cicero. Stephen Sharkey’s new translation is colloquial, idiomatic and full of TV gangster slang, but it’s ill-served by broad accents: the ‘gangsters’ sport East Coast Italian-American speech straight out of The Godfather. All of this, of course, is in typical Brechtian fashion: the play opens with a prologue in which the characters are introduced and summarily dismissed. 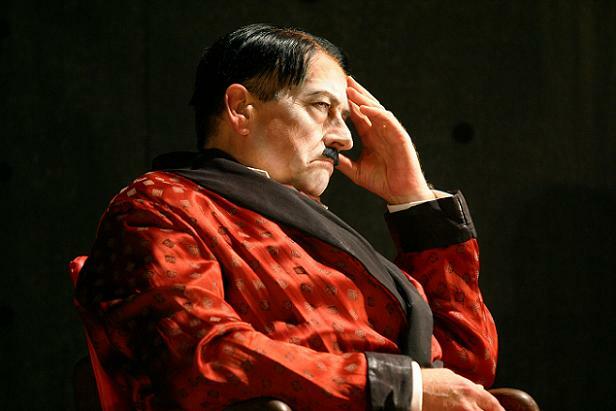 Characters and events are obvious analogues of their real-life counterparts, often to the point of pun: Dogsborough is President Hindenburg, Ciceronian representative Ignatius Dullfeet is Engelbert Dollfuß, and so on. The analogy is constantly explained by text running above the stage: useful to the uninitiated, sure, but the real purpose is to develop critical detachment between the audience and the stage. The actors’ white makeup, reminiscent of Greek theatre masks, further reinforces the play’s artificiality. As such, depicting Nazis as Chicago gangsters undercuts their self-mythologisation and rings true in another way, too: in the 1920s, Hitler was cultivating a gangster image by wearing a trench coat and a fedora, while carrying a bull-whip. The Resistible Rise of Arturo Ui is at its best when savaging the mixture of ingratiation and bullying that characterised the Nazis’ relationship with Germany’s ruling class and the elites’ self-serving opportunism, cowardice and well-honed skill at not seeing things one would rather not know about. The scene in which Ui flatters and browbeats Dogsborough into accepting his protection is thus the centre of the play, funny and terrifying and pathetic all at once. There was nothing inevitable, Brecht insists, about the rise of Hitler, a non-entity who could only have risen to power in specific historical circumstances and through the generous help of elites fearful of economic crisis and social unrest. That’s a traditional left-wing perspective I agree with; but Brecht, writing in 1941, got the record wrong on a couple of counts. He overstates the extent of ruling-class support for Hitler: the rich mostly funded more traditional right-wing parties until the failure of parliamentary politics to deliver for them became obvious. Moreover, the trial scenes suggest that the Nazis themselves were responsible for the Reichstag fire. We now know this wasn’t the case: just like 9/11, an unforeseen catastrophe presented a once-in-a-lifetime opportunity for the Right. 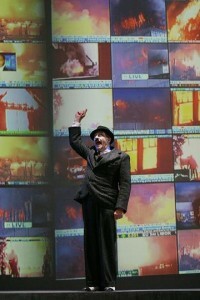 In the hands of Meierjohann and movement director Carolina Valdes, Arturo Ui is a play of exact positions and movements. The physical acting is top-notch: Ian Bartholomew’s Chaplinesque buffoonery is transformed into tightly-controlled regal poses when Ui, embarrassed by his common manners and eager to appear as a quasi-divine leader, takes lessons from a washed-up actor. The scene, comic at first, ends in Ui’s furious recitation of Julius Caesar’s ‘Friends, Romans, countrymen’ speech, his shadow looming behind him many times his size. Bartholomew gets both the gangster sleaziness and the Führer facsimile exactly right, but he is perhaps too charismatic: it’s easier to laugh with this Arturo Ui than at him. Brecht was surely right to prefer exposing fascism through humour to dignifying it with solemn remembrance. The Resistible Rise of Arturo Ui was a great night at the theatre, but above all it’s a weapon in the antifascist’s arsenal –as Brecht wanted it to be. For future Nottingham Playhouse productions, visit: http://www.nottinghamplayhouse.co.uk. Malte Ringer is a writer and activist based in the UK. He blogs at campuskritik.blogspot.com.